2016 Blogger Template is a clean and Responsive Blogger Template. It is a light & bright blog theme, tailored to showcase your content in an effortlessly timeless style. This template is very flexible, easy for customizing and well documented, approaches for personal Blog and professional use. We guarantee that, this is Best Seo Optimized Blogger Template in the Market with Multi Author Supported. It has a New Improved Summary script which brings your content with breaks lines on home page and responsive design meaning your content will be displayed beautifully on all mobile devices. 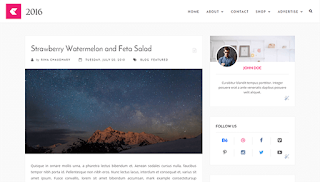 If you are looking for Minimalist blogger template then this is best option for you.